A lot has been going on around here for the past weeks. Squishy turned 1 year old, but that’s another story, and he has begun walking!!! Its like watching a tiny drunken old man stumble around the house! The cutest, most hilarious and oh so frightening thing all at once! Fall is coming quickly and it has me itching to bake. The heat kicked on last night! Yay, fall! Yes, I’ll be complaining that I’m freezing in just a couple of weeks, but oh, I love fall! Squishy loves food, especially muffins when it comes to breakfast foods. 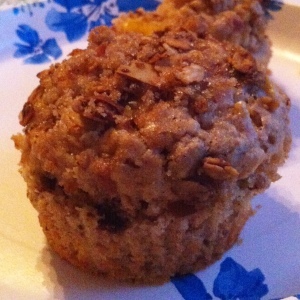 Last weekend we had some beautiful nectarines from the farmer’s market and a craving for muffins. So we got into the kitchen and whipped these up! Preheat oven to 400 and grease a muffin tin or line with paper liners. Combine dry ingredients in a large bowl. Gently stir in moist ingredients including your diced nectarine. Stir in about 1/2 of your granola. (our granola has slivered almonds in it, so i stir it in after filling 1/2 of the muffin liners. No nuts for squishy yet, choking hazard.) Fill your muffin cups 2/3’s full. Sprinkle tops with what’s left of the granola mixed with the brown sugar. Bake for 18-22 minutes or until nicely brown and a toothpick come out with just a tad bit of crumb. Squishy devoured these, so I hope you love them too! If you try them please let me know what you think! *I know the pre packaged flax meal can be expensive. I buy flax seeds in bulk at the natural food store, whole foods may have them too. Our Baby Bullet that we received for a shower gift has a milling blade so we grind them with that and store them in a jar in the refrigerator. If you don’t want to bother with it at all, just leave it out. A small handful of oats might be good in its place.